Don’t you love it when a plan comes together? And, when a plan involves pallet flow rack and big, bulky super sacks… well that’s all the better. Here’s a recent example. A consumer food products manufacturer was looking to optimize inventory and production. Part of their goal was having bulk ingredients in the right place and always at the ready. We knew that pallet flow was the perfect product but designing the right pallet flow lane for this unique inventory was the challenge. 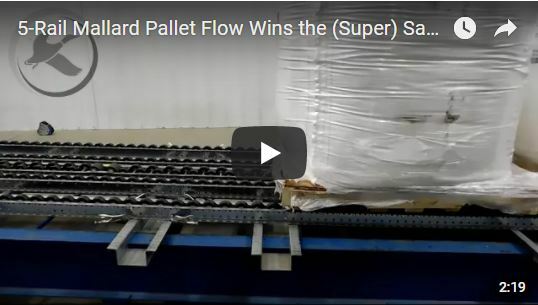 Mallard pallet flow rack provides the needed heavy-duty and reliable deep-lane solution the customer was seeking. However, to sufficiently support this bulky pallet load, our engineers tested a unique 5-rail system with 2.9” diameter wheels on 3” or 2” centers (3/3/2/3/3 lane configuration). In addition, they added drop-in speed controllers set at 56” intervals in the center lane to ensure that each pallet would have direct contact with a speed controller. The speed controller helps control the pallet’s speed and ensures proper indexing down the lane. As pallets arrived at pick aisle, they are held back by Mallard’s bolt-on ramp stops. The bolt-on ramp stop saves time and money because if a ramp stop is damage by a forklift or inventory (which can happen over time) only the stop needs replacing not the entire lane. As you can see in the test video the pallets flow well down the lane and restart without prompting after being left in the lane overnight. Success! The Mallard testing lab proved out yet another successful pallet flow lane design. For customers interested in replicating a system like this, keep in mind that pallet condition is a key to the success of the system. These pallets were in good condition, but broken or distressed pallets would perhaps hang-up in the lane and even potentially cause worker injury. So, it’s important to only use pallets in good condition and to restore or replace damaged pallets. 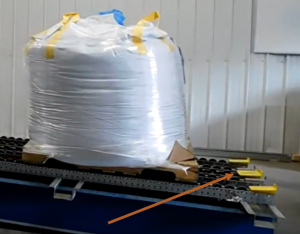 Also, if you regularly read this blog you know that… plastic wrap is to pallet flow / as kryptonite is to superman, so it is important for the forklift operator or other warehouse personnel to scan the pallet load and ensure that the wrap is secure before loading the system. 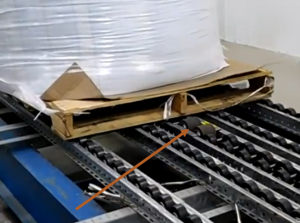 Dangling plastic wrap can get stuck in the pallet flow lane and cause system downtime and damage. Well, that’s a wrap… sorry, was that an audible groan? All kidding aside, gravity flow proves itself over and over again as a durable, efficient and economical inventory and storage warehousing tool. Bring us your optimization goals and let’s see what gravity flow products can do for you.